Alejandro González Iñárritu’s The Revenant is one of the best titled films of 2015. It’s also one of the best films of the year overall. 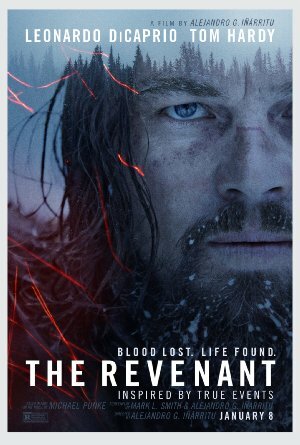 Inspired in part by the true exploits of famed frontiersman Hugh Glass, it stars Leonardo DiCaprio as Glass. He is the scout for a unit of trappers led by Captain Adam Henry (Domhnall Gleeson) and his son “Hawk” (Forrest Goodluck) is also traveling with the unit. Hawk is one-half Pawnee Indian and most of his conversations with his father are in Indian language. The trappers are ambushed by a group of Arikara Indians but some manage to escape in their boat. Glass suggests their best chance for survival is to make their way overland to their fort. John Fitzgerald (Tom Hardy) disagrees with the plan but goes along when Captain Henry says this what they will do. They are making progress when Glass, scouting ahead on his own, encounters a mother grizzly bear and her cubs. The bear mauls Glass but he manages to kill it. Gravely wounded, Captain Henry insists they will carry and care for Glass for as long as need be. But carrying their makeshift stretcher with Glass on it is difficult and the terrain challenging. At last Captain Henry asks for volunteers to remain behind with Glass and bury him properly after his death. Eventually, when the Captain offers a large cash payment for this duty, Fitzgerald agrees to remain with Hawk and Jim Bridger (Will Poulter). Fitzgerald decides he’s waited long enough and attempts to smother Glass, only to have to deal with Hawk. He kills Hawk and then convinces Bridger they need to leave Glass behind to save themselves from the Indians. However, Hugh Glass refuses to die. Overcoming obstacle after obstacle, he crawls, hobbles and does whatever he has to in order to come face to face with Fitzgerald. The day of reckoning that Doc Holliday mentions above is coming. Iñárritu has a tremendous ability to mix story, visuals, limited dialogue and just the right orchestral background music into a delight on both the visual and the auditory front. Some may quibble that the shots of the gorgeous yet harsh lands the travelers traverse are held a bit long; yet they are so stunningly satisfying as to render such quibbling useless. This may be the best performance yet for Leonardo DiCaprio, which is saying quite a bit. He captures the right mix of determination and anger that a father seeking to avenge his son’s murder would experience during such a challenging odyssey. His acting is enhanced by some terrific work by the makeup artists who make his injuries seem incredibly realistic. Tom Hardy, who was enjoying a banner 2015 with his terrific turns in Mad Max: Fury Road and Legend, is once again amazing. Films that run longer than 140 minutes will generally reach at least one point where the viewer sneaks a peek at their watch (or since this is 2015, a cellphone). That did not happen once during The Revenant, deservedly so.